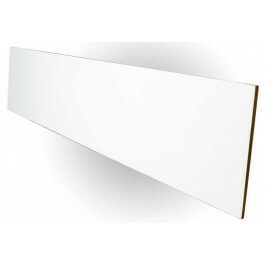 Pre-primed White Riser (Retro style), 1/4 in nominal (3/16" actual) x 7 3/4 in x 42 in length. Pre-primed white risers are a beautiful and economical addition to any staircase. They are especially popular in homes with other white trim and molding. White risers are also a great way to lighten a dark staircase or provide definition between steps. When ordering risers, you'll typically order the same length as the tread. These retro risers are designed to reface an existing riser while being thin enough not to offset your new retro treads past any existing skirtboard. Our white risers are shipped with the primer coat already applied and can be painted with your favorite brand of white paint to match the other trim in your home. Standard riser dimensions are 1/4" nominal (3/16" actual) thick by 7-3/4" tall by 42" long. These risers are designed to be used with our Retro stair treads as part of the complete staircase remodeling system. What type of wood are these Retro Pre-primed white riser 42"made of? We use high-grade Birch or Poplar veneered plywood as a base for our primed retro risers. 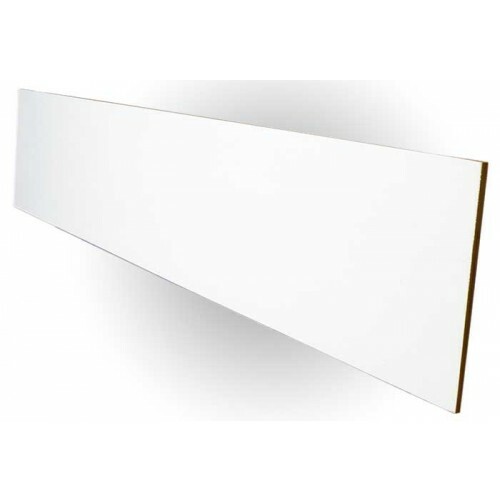 This gives a smooth and defect-free surface to prime. The primer is applied by machine to yield a smooth, consistent base which makes applying the final coat of paint a snap once you receive them. We have stairs that currently have carpet oh them. Will this product work after we remove the carpet? This item is used to cover the existing riser once the carpet is removed. Is the price liisted an individual price or a package price? If it's a package price, how many treads and or risers come in a package? The prices on our website is a unit price and you can order as many or as few as you need with no minimum orders! I noticed that the price for the Traditional Pre-primed white riser 42" is $13.36 and the price for the Retro Pre-primed white riser 42" is $13.49. It would seem that the 1/4' Retro riser would cost less than the 3/4" Traditional riser because there is less material. Is this an error? The cost for these items is correct.